We’re making trips more attractive! We know it’s frustrating when you get a pick-up that’s far from you, and that the extra distance eats into your petrol costs. That’s why we’re introducing Far Pick-up Bonuses! What’s a Far Pick-up bonus? Note: Your app version must be v5.34.0 (Android) or v1.21.0 (iOS) and above. How will I know if a job has a Far Pick-up bonus? If a job qualifies for the Far Pick-up bonus, the bonus will appear on the in-transit screen. Note: This bonus will not be paid by the passenger, so please do not collect it as part of the passenger’s fare. Q: Who pays for the Far Pick-up Bonus? A: The Bonus amount will be paid by Grab. Please do not collect this amount from the passenger. Q: If I miss or ignore a job with a Bonus, will my next job have a Far Pick-up Bonus as well? A: As the Far Pick-up Bonus is dependent on the nature of the Job’s pick up, there is no guarantee that your next job will have one. Q: Will commissions be deducted from the Far Pick-up Bonus? A: No. Grab will not deduct any commissions from the Bonus you receive. Q: If I do not update my Grab Driver app, am I still eligible for the Bonus? 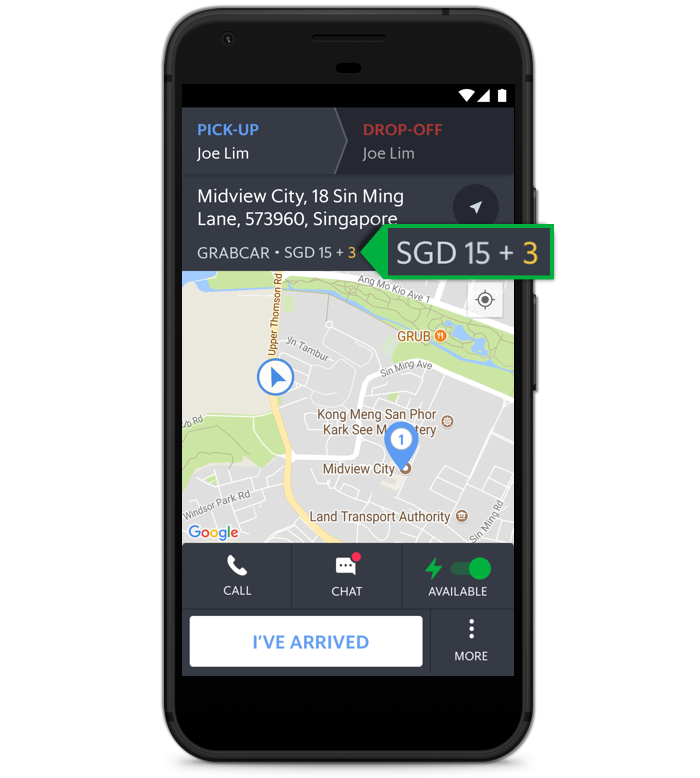 A: If you do not update your Grab Driver app, you will not be able to see and receive any Far Pick-up Bonuses. To be eligible for these bonuses, please ensure that you’re on Android v5.34.0 / iOS v1.21.0 or above. Q: When will the Far Pick-up Bonus be paid out to me? Will it be paid immediately after the job ends? A: Yes. It will be paid out upon the completion of the job. Q: How will I receive the Far Pick-up bonus? A: It will be paid directly into your Grab Driver app cash wallet. Q: I accepted a job with a Far Pick-up Bonus but it was cancelled. Will I still receive the bonus? A: No. The Bonus is only paid out if you complete the job. However, if the job was cancelled 5 minutes after you have accepted the booking, you will receive a compensation of $4. Click here for more details! Q: I got a Back to Back job that was more than 3KM away from me, do I get the Far Pick-Up bonus? A: In cases where you get a Back to Back job, the Far Pick-Up bonus will be based on your current job’s drop-off location. As such, you will only get the Far Pick-Up bonus if the pick-up location is more than 3KM from the current job’s drop-off location! Q: Where can I check if the Far Pick-up Bonus was paid out me? A: You may check your cash wallet transaction history, job history or your Partner Statement. Q: On which screens in the Grab Driver app will I be able to see the Far Pick-up Bonus? A: The Bonus will only be shown on the in-transit screen, in your job history, and on your Partner Statement.